I am proud to be a Julep Maven! Would you like to be one too? You may be asking yourself "What is Julep?". It just so happens that I'm here to answer that for you! I signed up for the monthly Julep box which, based on my preferences, ships two gorgeous nail polishes & a goodie OR three polishes (the It Girl profile always has three polishes) to my door every month! A 'Julep Maven' always gets 20% off all products on the site PLUS free shipping for every order. Around the 20th of each month, you'll get an email from Julep that previews the upcoming box. If you like what you see, you don't have to do anything - they'll ship it out for you. If you want to try a different box, send a box to a friend, or simply skip the month, just log in to your account between 20th-24th and change your preferences. You are charged on the 27th of each month, which is the same day your Maven Box ships! It's that simple! Facebook, YouTube, Pinterest, Google+ or Twitter. One of the things I love about Julep is that they donate a portion of proceeds from products sold to organizations that support women through the Powered By Girlfriends Program. They also follow what they like to call 'The Girlfriends Oath', which means that their products promise to be toxin free! You can also find this mani liked up at Glitter & Gloss for Mani Monday. I ordered the July "Bombshell" Box. 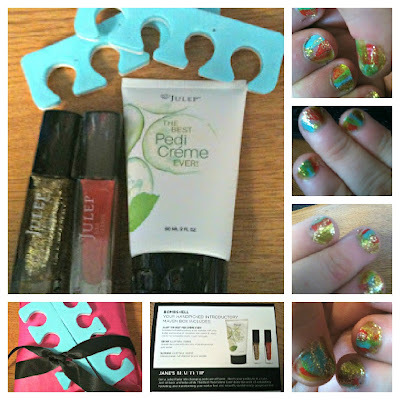 It features the Julep Best Pedi Creme Ever, Oscar Nail Vernis & Natasha Nail Vernis. The Best Pedi Creme Ever exfoloiates with alpha hydroxy acids, hydrates with shea butter and coconut oil and nourishes with vitamin E. Apply nightly for noticeable results in just 1-2 uses! The Oscar Nail Vernis is a light multi dimensional gold glitter that works as a lovely top coat on top of other polish, or as a stand alone stunner! The Natasha Nail Vernis is a bright, intense red-orange. I've always had a problem finding a good red, as I really don't like pink-red colors, but this bottle is the perfect bright orange-red that I've been looking for! I am absolutely thrilled with my Julep Box! I love both of my colors and the pedi creme is perfect thing to use for your at-home pedi! WANT TO GET YOUR JULEP BOX FOR ONLY ONE CENT?! I've got a fantastic code to share with you lovely readers. Use code "MAVENINTRO" and you'll get your first box for just one penny! Click here to sign up & get this incredible deal! and will not be shipped by Fashion In The Forest. Thank you, Julep! You rock! I love Julep, I'm excited about the giveaway! Visiting from Mani Monday, love your blog! Love your color choices and your design is so cute! Can't wait to try out Julep myself! Love the nail art!! I also love the giveaway! !